How many of you have a bucket list? You know that list of things you want to do before you die? 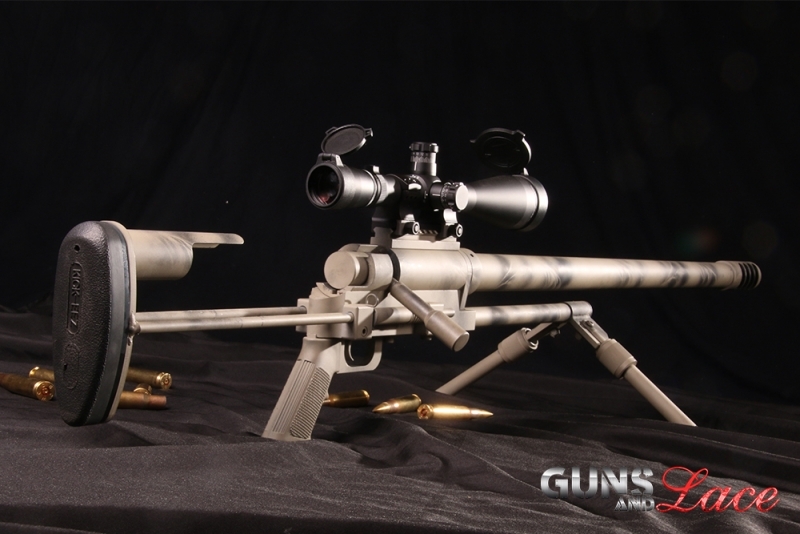 If you are a shooter, most likely shooting a .50 caliber BMG distance rifle is on that list. Well folks, I can tell you that crossing off the big Kahuna of rifles from my list was indeed as sweet as sweet can be. There is a famous name that comes to mind when I think of 50 cal rifles but promises made by sales reps at Shot Show, it turns out, are not always kept. Even if they are whispered in a girl's ear repeatedly year after year. Disappointed upstairs, I wandered downstairs and stopped by Noreen Firearms' booth and asked what caliber a very serious and heavy looking sniper rifle on display was. When I heard .50 cal. the huge smile that broke out on my face brought a big return smile back from Nathan Pitcher the National Sales Manager at Noreen. "So you like .50s?" He said. "I do!" I said, grinning like a kid in a candy store. "Well, this one is a honey, and I promise you that if you shoot it, you'll fall in love with it!" OMG, did he say "SHOOT IT!?" Together we talked guns, calibers, distance shooting and the pros and cons of a rifle that was longer than I am tall, shoots a round that looks more like an artillery shell than a rifle bullet and is capable at 1000 yards. I found it to be one of the most pleasant conversations of the day at the convention. These are down to earth, real people that are passionate about the firearms they manufacture. Most of all, they understand that the majority of us still have to work for a living and that .50 cal rifles can be all kinds of effective and awesome without having to be decked out or priced like a darn Stratovarious! I found out that one of their biggest challenges and sales objections is that a lot of men are intimidated (though they won't admit it) by the .50 cal cartridge and shooting a rifle that weighs in at 32 lbs and fires a 647 grain projectile. The team at Noreen have shot it, their wives have shot it, and they all know that with their proprietary recoil system, grip and bipod, that this isn't a monster at all. Sure it is a BMG (Big Mother Gun), yes it has a respectable amount of recoil, but monster? No way! So I offered to do a review and let the boys out there know that if our Guns and Lace girls could handle it; you big, macho, studly guys out there can handle it. When the ULR-50 arrived at my FFL's shop, they called and I came right over. We opened the box together and before you know it there were 8 people gathered around it ohhhing and ahhhing. Ferrari luster? Nope! Porsche curves? Nope. Deuce and a Half cool, you betcha! Camo green, simple but super utilitarian and well thought out design? Yep! Sure it barks like a big dog, it is a .50 cal! Accurate as sin? Absolutely. Archer, at 110 pounds shot it like a boss. Watch the video and see for yourself. We took it out and shot it at 200 yards and then made the drive to a really nice distance range called Rattllesnake Mountain Range near Yakima, Washington. A few of the guys from the Tri-Cities Shooting Association were kind enough to host and provide us with staff to assist us in marking the targets in the pit. Thanks guys, you rock! We were accompanied and assisted by National Champion and World Title holder, distance shooter, Anette Wachter, aka .30 Cal Gal. After setup and a bunch of wind readings (it was blowing 10 to 25 knots) and a lot of corrections and input from Anette, I drilled the X at 600 yards on the first shot. It turned out that the first shot was best shot of the day, but we were continually in the 10 ring at both 600 and 1000 yards. After 15 rounds, I was a bit sore in the shoulder and did end up with a light bruise or two, but it was just enough to make me proud of my accomplishments. 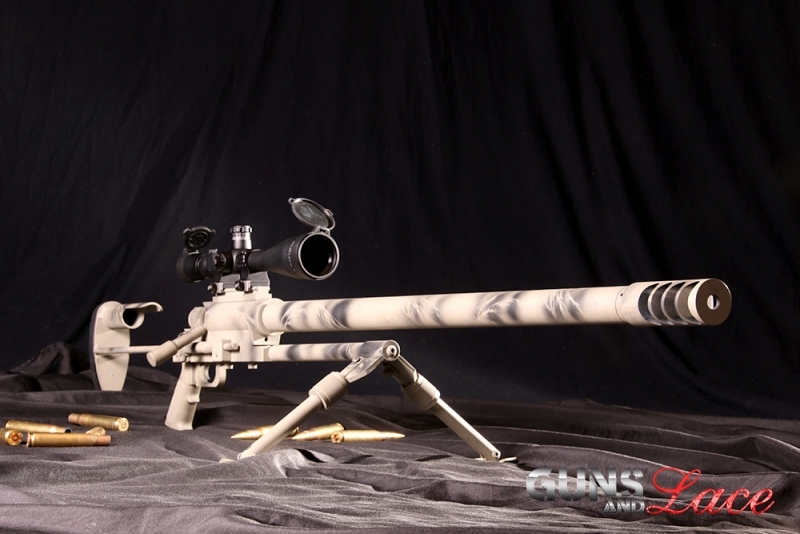 I have to tell you, the Noreen ULR .50 is one well made, built to shoot rifle. Simple in its design and construction that it truly is an understatement in efficiently reaching out to touch something. 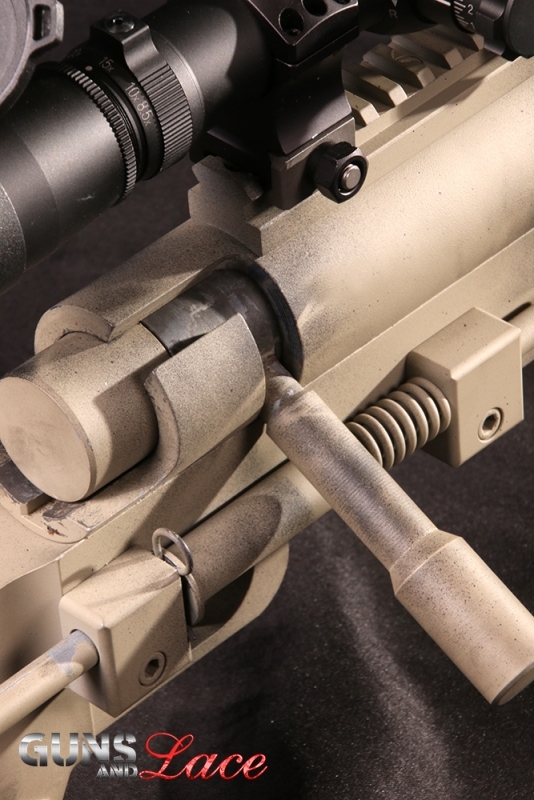 With a huge muzzle brake, this bolt action rifle, raised a heck of a cloud of grass, dirt and dust from its muzzle blast. Trust me, you'll want to remember to close your mouth when you fire a .50 or prepare to be spitting out dirt and grass for a while. I suggest good wrap around eye protection too to keep the dirt out of your eyes. 50 caliber rifles are famous for a pretty significant shock wave and they do kick up a lot of debris. When a woman is victimized, she's two choices. Submit or fight! Gorgeous Guns and Lace girl Archer Tesla is a fighter and a survivor. When a druged out mugger pulled her down an alley, she fought back. Though she received several stab wounds in her abdomen, Tesla took down her attacker and with the help of a couple of passerbyes, the bad guy did not get away. Following her recovery Tesla decided that she would never be a victim again and has trained and become proficient with firearms. An adventurer at heart, Tesla enjoys shooting, photography, modeling, traveling and pursuing life, liberty and happiness to its fullest. Make sure you watch the videos of her shooting the .50 cal. Her smile will tell you all you need to know about a beautiful young woman who knows every day of life is a gift! Guns Up Salute to you, Tesla!